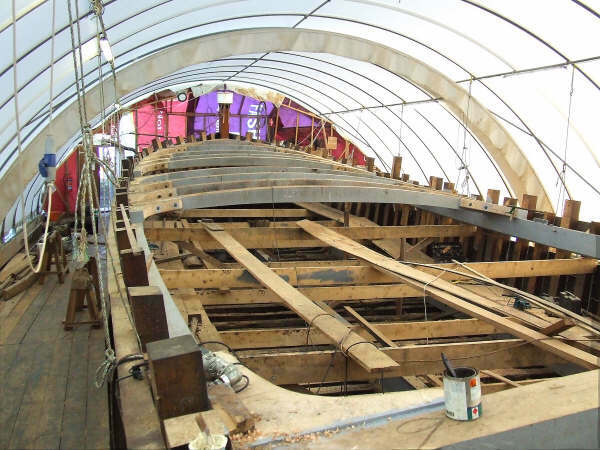 THALATTA’s hull was of double planked carvel timber construction, being oak framed with pitch pine decking. She was used for a number of different functions during her life, being built as a commercial speculation in 1906, first operating as a spritsail rigged coasting barge, but then being converted to a ‘boomie’ (a gaff ketch). In May 1917 a 70 horse-power two-cycle vertical oil engine was fitted in the former skipper’s cabin aft. Her fore-hold was converted to accommodate her crew which now included an engineer. Her rig was cut down and she operated as a motor barge. In May 1923 the engine was removed and her gaff rigged mainsail was replaced with a spritsail, but she retained her gaff mizzen, making her a “mulie”. In 1948 a Ruston and Hornsby marine diesel engine was installed and she again de-rigged to became a motor barge. Her current engine is a Kelvin R6 six cylinder 112 hp diesel engine. 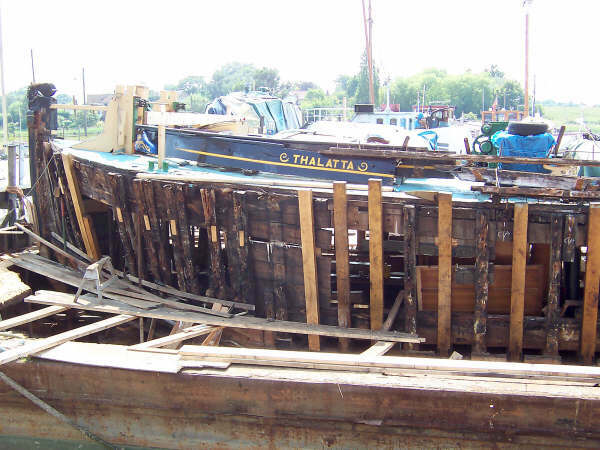 THALATTA’s condition deteriorated over the years, as rainwater entering the hull through leaky decking rotted the frames. On her commissioning by the Sail Trust in 1967 she was re-rigged as a mulie and has retained this configuration today. Her hold was converted into accommodation with twelve hammocks. She retained the quarterboards (boards raised above the bulwarks along a ship’s quarter) which lifted the height of her rails aft. In the 1980s new rails, covering boards and doubling side hull planking were fitted. An extensive conservation programme began at the end of 2005. All of the side frames and deck beams, as well as the chine keelsons, required replacement. 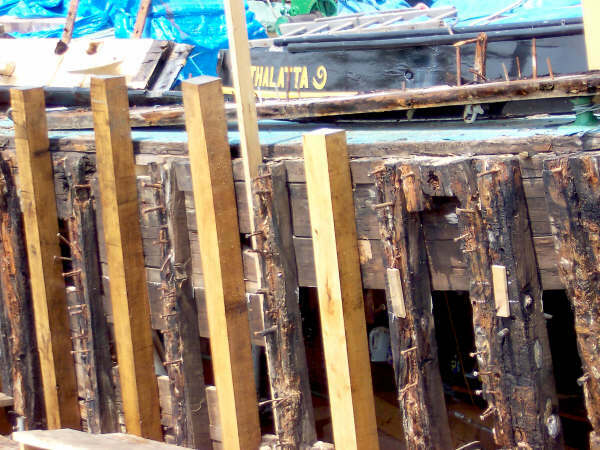 By February 2010 a large proportion of the hull had been replaced, whilst the bottom planking and floors (the bottom cross frames) remained original. THALATTA has strong local associations with Mistley. She was launched in a ceremony on 6 February 1906 by Coralie Clare Horlock, daughter of the new owner, Frederick W Horlock of Mistley. Her first skipper was Jim Alliston, also of Mistley. She worked further afield around the UK coast, visiting Antwerp, Dunkirk, Nieuwpoort and Rotterdam, as well as East Coast ports including Lowestoft, Harwich, Hull and London. In later years she made frequent passages to Newcastle and Sunderland, and down the Channel to Appledore in North Devon. She took malt from Mistley and Ipswich to Dublin, Wicklow and Wexford in Ireland. THALATTA continued to work throughout the First World War around the Thames estuary and in 1916 she ran between Shoreham and Dieppe loaded with pig iron. At the end of the war she was employed taking materials to Flanders for post-war rebuilding. In her later career, she built on her European connections, carrying cargos to Paris, Antwerp, Brussels and Rotterdam and subsequently working between the West Country and the Channel Islands, the South Coast and North-East ports. In 1967 she began a new career in educational and adventure cruises, with thousands of children undertaking day voyages from her East Coast base. THALATTA has been recorded on the National Register of Historic Vessels since 1996 and is part of the National Historic Fleet. Her national significance is the result of her role carrying cargo during both world wars, and in her being a rare example of a surviving ‘beetle barge’ still afloat. Her regional and European significance is due to her long association with the Thames Estuary, East Coast and Continental ports. THALATTA’s primary purpose was as a spritsail rigged coasting barge. She has a bluff bow, a plumb straight stem and a transom stern. She has a single deck and carries two masts. Her large hold, now sympathetically adapted as an accommodation and educational space, gave her the capacity to carry significant loads and her shallow draught, flat bottom and distinctive leeboards enabled her to take the ground on the East Coast rivers and manoeuvre herself effectively. Although her cargo and sail configuration varied over the years her function as a cargo barge remained unchanged, with her shape and mode of construction making her entirely fit for purpose. 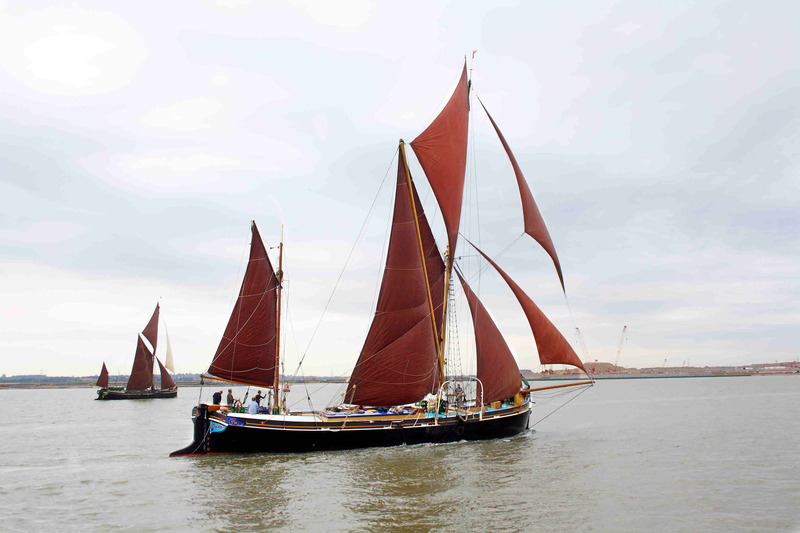 Today, as a sail-training spritsail barge with red ochre sails, THALATTA strikes an imposing and attractive image when under way and continues to operate in her original location around the East Coast. Built by W B McLearon at the naval yard in Harwich, as a speculation (like Ena, q.v. ), THALATTA was launched in a ceremony on 6 February 1906 by Coralie Clare Horlock, daughter of the new owner, Frederick W Horlock of Mistley. 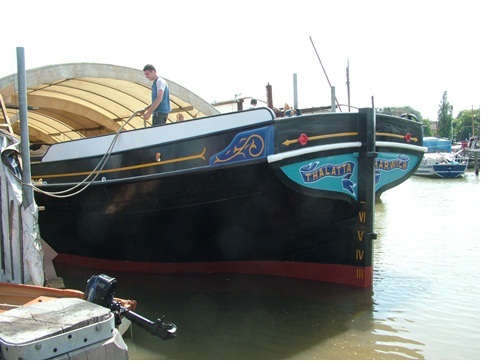 She broke a bottle over the bows of the new barge which then slid gracefully into the water. THALATTA left Harwich for Mistley to load her first cargo, wheat for London. In 1906, as well as the east coast ports of Lowestoft, Harwich, Mistley, Hull and London, her passages took her to the near continent including Antwerp, Dunkirk, Nieuwpoort and Rotterdam. Her first skipper was Jim Alliston, of Mistley. 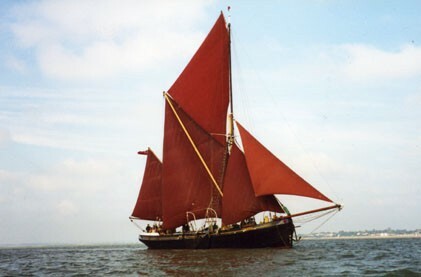 THALATTA was at first a spritsail rigged coasting barge but at some early stage was converted to a boomie (a gaff ketch). In later years of Horlock’s ownership the barge made frequent passages to Newcastle and Sunderland, and down Channel to Appledore in North Devon. She also took malt from Mistley and Ipswich to Dublin, Wicklow and Wexford in Ireland. In November 1908 she was caught in a heavy storm when on passage from Sunderland to the Thames, and was towed into Lowestoft with a broken main gaff and a torn sail; seven other barges were either lost or driven ashore in this storm. In January 1909, when loaded with maize from the London Docks, she was in collision with the steamer Forth in Blackwall Reach, sustaining considerable damage to her starboard side, and had to be repaired by Shrubsall’s at Greenwich before continuing her voyage. The early part of the First World War was spent working around the Thames estuary followed by a year of lightering in the Thames. In 1916 she ran between Shoreham and Dieppe deep loaded with pig iron. On 25 May 1917 she was sold to Wynfield Shipping Co of Grimsby. A 70 hp two-cycle vertical oil engine was fitted in the former skipper’s cabin aft, and she was used as a supply vessel to the Humber boom defences, with Percy Richmond as her skipper. Her fore-hold was converted to accommodate her crew which now included an engineer. Her rig was cut down and she worked from Grimsby as a motor barge. At the end of the war Herbert Body, of Southend, took over as skipper and she was employed taking materials to Flanders for post-war rebuilding. Between 1919 and 1921 her passages took her to Paris, Antwerp, Brussels and Rotterdam. After that she carried cement to Torquay, china clay from Fowey to Greenhithe, and granite chippings from the Channel Islands. On 19 May 1923 THALATTA was sold to her skipper, Captain Herbert John Howlett Body, who removed the engine, and replaced her gaff rigged mainsail with a spritsail, but she retained her gaff mizzen – making her a mulie. This reduced the crew from the boomie’s four to two men and a boy. Body traded her to ports on the north-east for coal and the south coast with wheat, as well as the near continent. In 1932 she is known to have delivered materials to Lewes in Sussex to build a new railway line. On 5 August 1933 THALATTA was sold for £450 to R & W Paul (Maltsters) of Ipswich and was employed carrying imported grain from Royal Docks in London to Ipswich, returning with malt or flour. She also took animal feed to Colchester and Faversham. From 1934 to 1947 her master was Bob Ruffles, and then Joe Lucas took over. In 1946 the Clacton lifeboat EDWARD Z DREZDEN assisted THALATTA into Brightlingsea after she had got into difficulties near the Gunfleet Sands. In 1948 a Ruston and Hornsby marine diesel engine was installed at Richards’ yard in Lowestoft and she became a motor barge. Her master in the fifties was Charlie Webb and, from 1956 to 1960, Bob Wells. 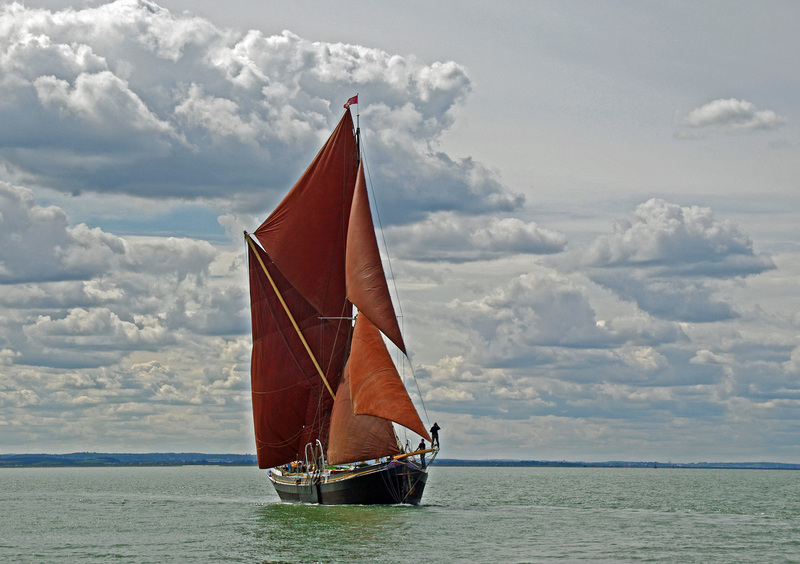 On 1 January 1967 she was sold for £1500 to John Kemp, of Maldon, for use by the Sail Trust (who became her owners in 1971). 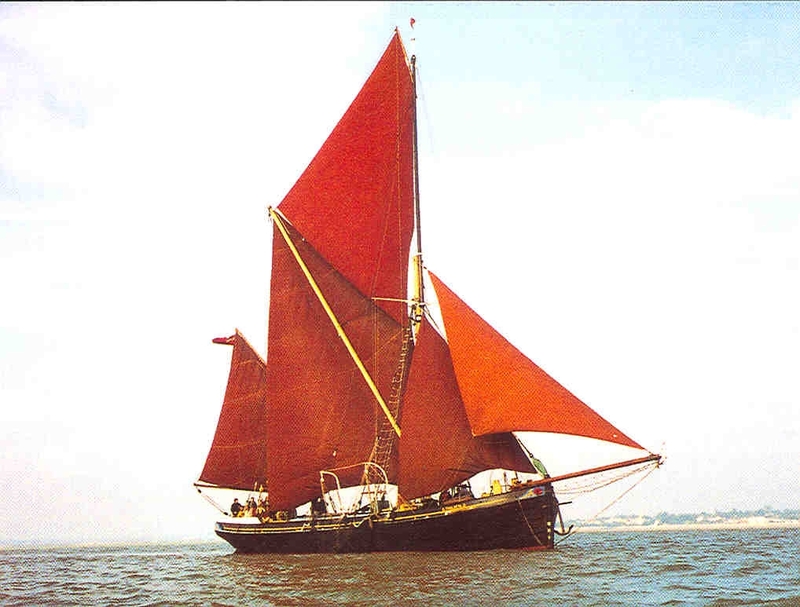 The Sail Trust (which was renamed the East Coast Sail Trust in 1971) had operated the sailing barge MEMORY providing holidays for school children from Maldon. 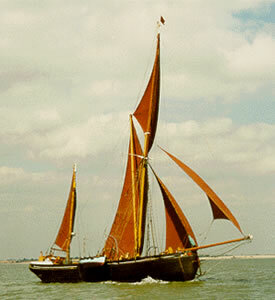 In 1967 they sold her and commissioned THALATTA,with John Kemp as her skipper and Jane Benham as mate. She was re-rigged as a mulie, using sailing gear and leeboards from MEMORY. She retained the quarterboards which raised the height of her rails aft. Her hold was converted into accommodation with twelve hammocks for the schoolchildren and THALATTA began her new career in educational study and adventure cruises, with a contract from the London Borough of Redbridge. Thousands of children from schools and youth organisations have lived and worked as crew on the five day voyages, alongside the permanent crew of three. In September 1987 John Kemp died at the wheel of THALATTA, near Mersea Island. Inevitably the ancient vessel’s condition deteriorated over her long life, as rainwater entering the hull through leaky decking rotted the frames. In 2004/5 grant support of £724,000 from the Heritage Lottery Fund was approved for the rebuilding of THALATTA at a total cost of £1.1m. 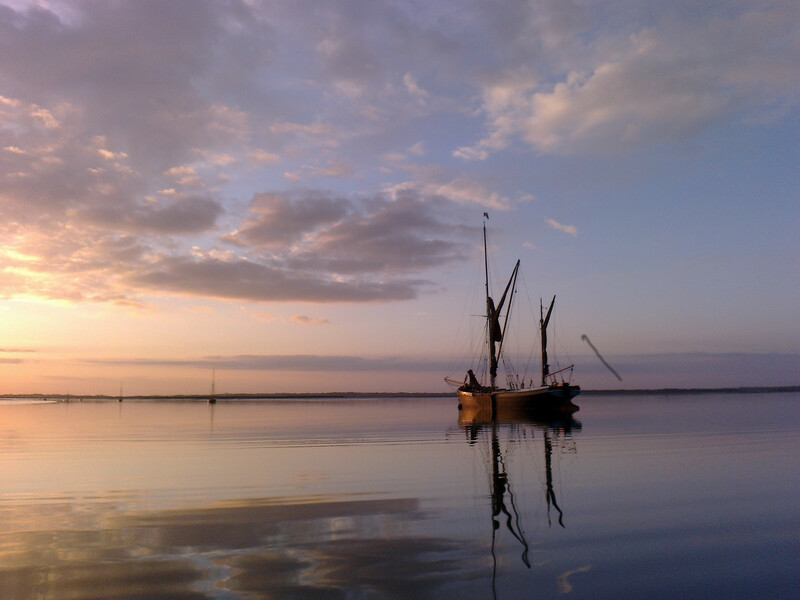 At the end of the 2005 season she was laid up, and was subsequently sailed to St Osyth where the restoration would be undertaken by a team of shipwrights led by Andrew Harman. A special quay was built at the St Osyth Boatyard for the timber for the rebuild, and a pontoon was converted into a dry dock. The timber was sourced from Suffolk, Essex and Norfolk, as well as overseas. In March 2006 THALATTA was moved onto the pontoon for work to commence. Soon, as the vessel was dismantled, the full extent of the work needed became evident. All of the side frames and deck beams, as well as the chine keelsons, required replacement. 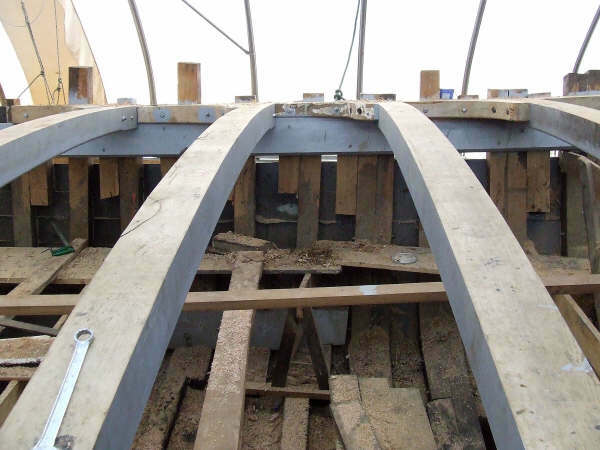 Despite delays caused by delays in raising matched funding, by February 2010 work on the hull was almost complete with a large proportion of the original hull replaced, whilst the bottom planking and floors (the bottom cross frames) remained original. 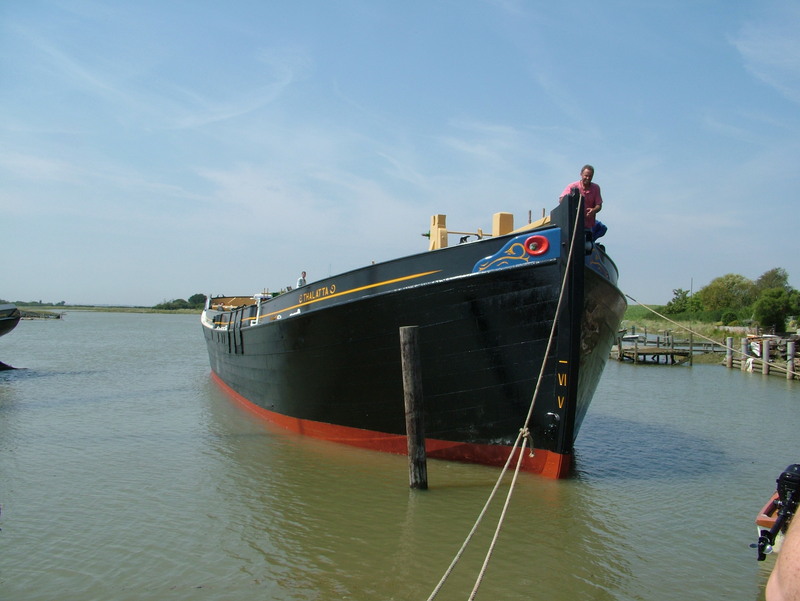 THALATTA was re-launched at St Osyth on 1 August 2011 for fitting out in the winter months, and left there for Maldon on 10 April 2012 to start her first season after the rebuild.